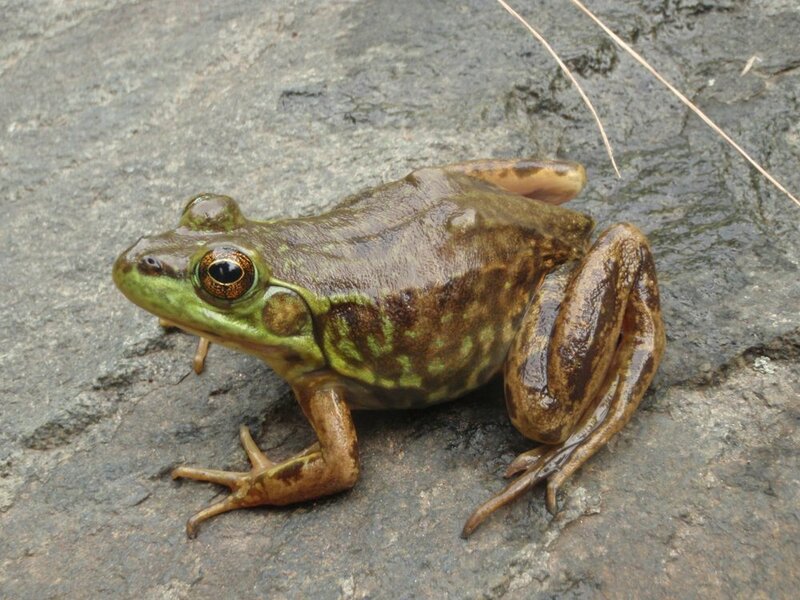 Where the Green Frog (Lithobates clamitans) and the Mink Frog (Lithobates septentrionalis) co-occur, confusion over species identity often exists when unable to hear them call. This post highlights a few visual features to help with species identification in the field. Below are a few useful features to examine when differentiating between green frogs and mink frogs. Dorsolateral Folds: These ridges are raised skin that run down the sides of a frog's back (Figure 1). In the green frogs these ridges are prominent, whereas in mink frogs these ridges are typically absent or faintly present. Smell: As bizarre as it sounds, smell can also be useful in this case. Mink frogs smell distinctly like onions when handled. Green frogs... well, do not. Body Shape: Though perhaps a bit more subjective, mink frogs have a slightly more compressed-appearing head and slightly more rounded snout when compared to a green frog. Mink frog (Lithobates septentrionalis) from northern Minnesota. Photo: Christopher E. Smith. Figure 2. Green frog (Lithobates clamitans) with striping on high leg. Photo courtesy of Mark Nenadov, Wikimedia Commons. Hind Leg Markings: In addition to the presence / absence of a dorsolateral fold, the pattern of marking on the hind leg can be very helpful. Green frogs have striping that often spans the crus and thigh (Figure 2). Mink frogs have blotches on the hind leg. Figure 3. Comparison of a Mink Frog (top) and Green Frog (bottom) hind foot. Note the toe length of the 3rd toe compared to the 1st. Mink Frog from Sherburne County, Minnesota and Green Frog from Anoka County, Minnesota. Toe Length and Webbing: Toe length may also be helpful for distinguishing between the two species when frogs are in hand (Figure 3). The 3rd toe on a Green Frog is noticeably longer than the 1st toe on the hind foot. The 3rd toe on a Mink Frog is similar or shorter in length than the 1st toe on the hind foot. Hind-foot webbing also extends closer to toe tips on Mink Frogs, however this characteristic can be difficult to evaluate in the field unless the observer has both species in hand. Get it? Got it? Not so fast... Interestingly, in some areas individuals possessing intermediate appearance occur (Figure 4). Are they green frogs? Mink frogs? Or something else entirety? I've often wondered if the two species hybridize, but to date I am not aware of molecular evidence to support a hybrid hypothesis. It has been suggested that perhaps green frogs are mimicking mink frogs in areas of overlap, or perhaps the two species are converging on similar appearances due to natural selection (see: Moore 1952), but more research is needed. Perhaps someday someone will illuminate the mystery behind these intermediates. Until then... happy herping and document your finds on HerpMapper.org. Figure 4. Frog displaying intermediate appearance. Prominent dorsolateral folds and pointed snout point toward green frog, hind leg pattern most similar to a mink frog. Photo courtesy of Simon Pierre Barrette, Wikimedia Commons. Moore, John A. 1952. An Analytical Study of the Geographic Distribution of Rana septentrionalis. The American Naturalist, Vol. 86:5-22.